'Sunburnt Country' ( Janet Hutchinson, R. 1995) DDSL3 33 (84) Early, midseason, late bloom. 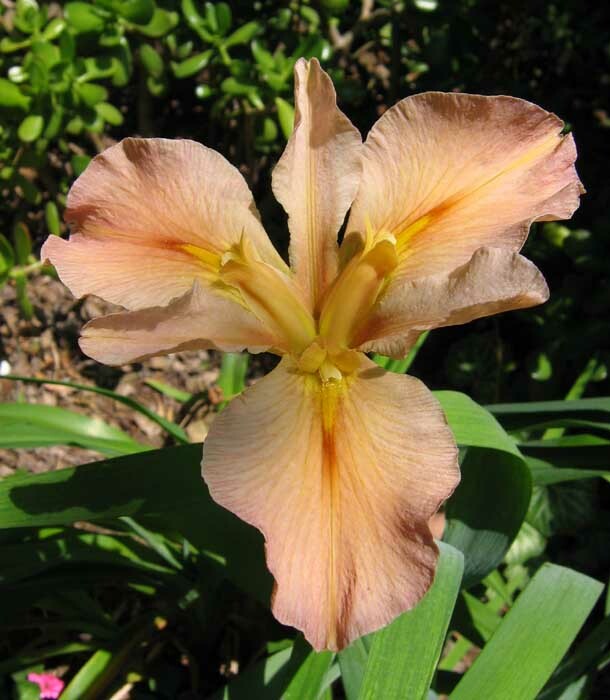 Standards pale apricot to terracotta, strong pinkish brown center line; style arms blended apricot yellow, green center; Falls pink apricot to terra cotta over cream, tips tinged mauve pink, brown center line, olive veining, small rich yellow signal; slightly ruffled, slight sweet fragrance. 'Delta Dawn' x 'Soft Laughter'.